As an auxiliary to the Government, Lao Red Cross conducts activities within a range of programmes including emergency response, water and sanitation, health, disaster preparedness and risk reduction, livelihoods, first aid, HIV/AIDS, dissemination of humanitarian values, tracing and youth. In September 2002 Lao Red Cross and its key partners signed the region’s first Cooperation Agreement Strategy. Lao Red Cross works in collaboration with a number of ministries, and has a memorandum of understanding (MOU) or development contracts with a number of National Societies in support of its programmes. Branch Offices: 18 provincial offices (chapters) with 92 district branches. Date Established: Formed: 1 January 1955; Recognized by ICRC: 23 May 1957; admitted into IFRC: 20 October 1957. Legal Status: Lao Red Cross was officially recognised as an independent National Red Cross Society following the politiburo Decree of December 1992 and the Prime Ministerial Decree of December 1993. 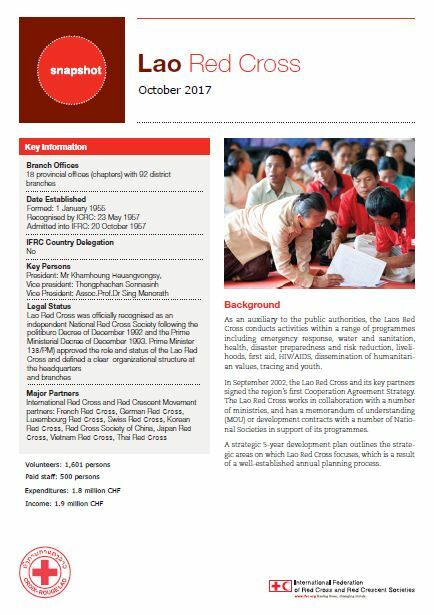 A further Decree in 1999 (Prime Minister 138/PM, dated 13 May 2013) approved the role and status of the Lao Red Cross and defined a clear organizational structure at the headquarters and branches. Major Partners: International Red Cross and Red Crescent Movement partners: French Red Cross, German Red Cross, Luxembourg Red Cross, Swiss Red Cross, Korean Red Cross, Red Cross Society of China, Japanese Red Cross, Viet Nam Red Cross, Thai Red Cross. Program Overview: Blood service is implemented throughout the whole country (18 Provinces).